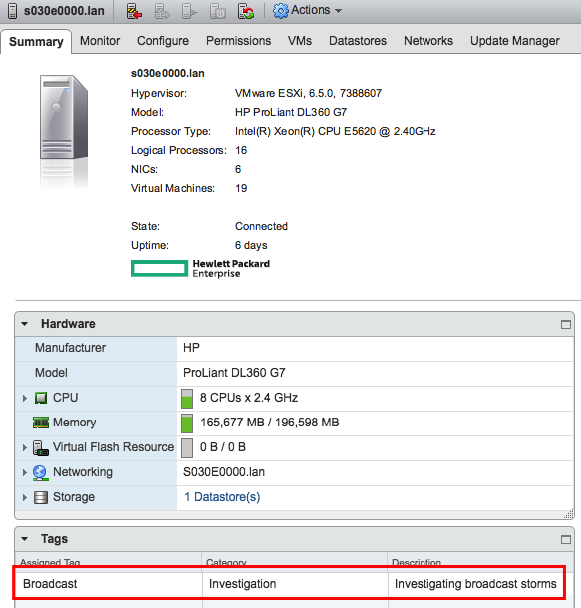 A customer recently reached out to me with the question if vROps could help him find a particular VM obviously causing a broadcast storm. The only information he got from the networking department was the host name and NIC of one of his ESXi hosts. The vCenter metrics did not reveal any valuable information and he had to check every single VM (more than 30 per ESXi host) one by one. At the end he asked if vROps is capable of finding that bad guy. First step was to check if we have such a metric for VMs and whether it is active (collecting data) or not. As you can see in the following figures, vROps knows that metric but it is disabled by default. 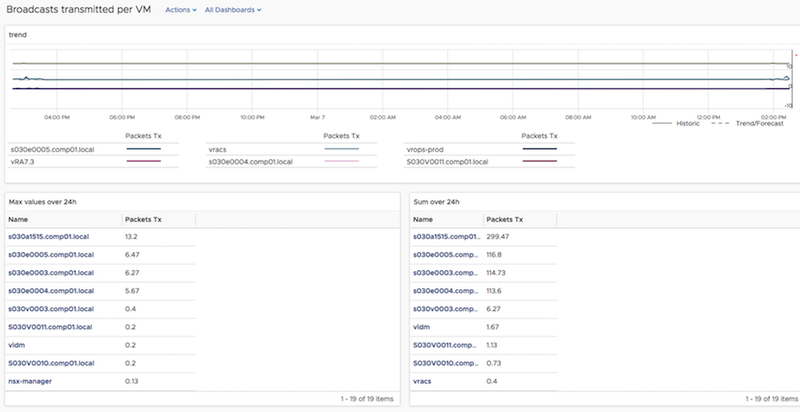 Now, you could go and just activate these metrics for all of your VMs and check the values. But, in an environment with several thousands of VMs it will add additional load and you will need these metrics only for some few VMs and for a limited period of time. Let us make it more dynamic and configurable for future use, just in case your NOC may come to you with another ESXi host you have to check. The idea is pretty simple, we need a policy which enables the needed metrics and we need a group of VMs we would like this policy to be applied to. Step 1: create a new policy and activate the broadcast metrics for Virtual Machine object type. The following figure shows you the filters and settings to activate the right things. We want to get this policy applied only to a dynamic group of VMs we would like to investigate. This is where the concept of Custom Groups comes into play. Custom Groups work as a container for any objects you may have and the settings of a Custom Group allow the membership to by dynamic based on a wide range of properties, relations etc. Now we could go to vROps, create a new custom group and define that group to contain all VMs which are children of a particular predefined ESXi host. This would be semi-dynamic. 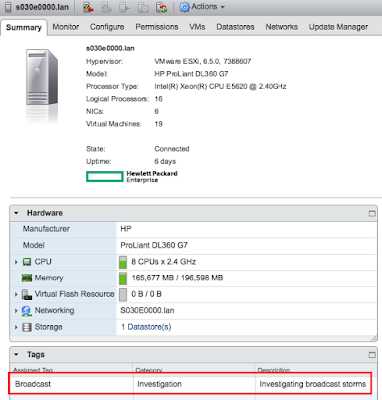 I many cases the admin dealing with a broadcast storm in a vSphere environment do not have to be the vROps admin in his org. Wouldn't it be better if the vSphere admin set "something" in vCenter and at the end he will see a dashboard or receive a report in/from vROps? Exactly, we go for the vSphere Tags. Our new tag will designate a host as being "under investigation", time for the next step. As we have our tag we continue with a "two-staged-custom-group". The first group will dynamically contain ESXi hosts under investigation, and the second group will contain Virtual Machines which run on those hosts. This will give us the freedom of creating multiple "second-stage-groups" which may have different policies assigned, in case we would like to investigate another behaviour which requires another metrics etc. Anytime we assign our new vSphere Tag to a ESXi host, this host will become member of this group. Time for the "second-stage", the custom group containing the VMs. Once we created the custom group for the VMs, this group gets populated with VMs which run on tagged ESXi hosts. Hope, this post will help others during their RCAs. 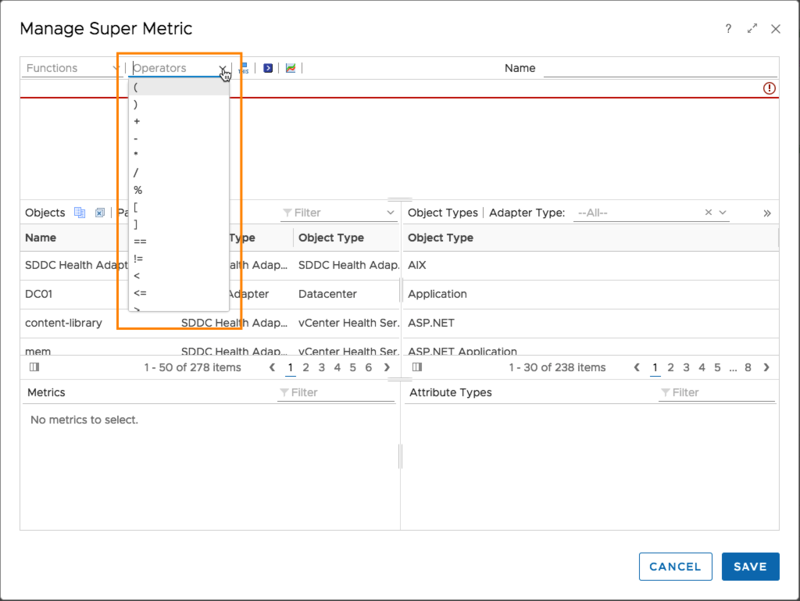 vRealie Operations Super Metrics are a very flexible and powerful way to extend the capabilities of the product way beyond the OOB content. There are many blog articles out there explaining how to basically use super metrics but only very few sources gives some examples how to put logical expressions into your formulas. So the question is, how dos this work? Using some simple examples I am going to explain how the magic of logical expressions work in vROps Super Metrics.